Nephrology is a specialty of medicine that concerns itself with the kidneys: the study of normal kidney function and kidney problems, the preservation of kidney health, and the treatment of kidney problems, from diet and medication to renal replacement therapy (dialysis and kidney transplantation). Systemic conditions that affect the kidneys (such as diabetes and autoimmune disease) and systemic problems that occur as a result of kidney problems (such as renal osteodystrophy and hypertension) are also studied in nephrology. Chronic kidney disease (CKD) is a type of kidney disease in which there is a gradual loss of kidney function over a period of months or years. Early on there are typically no symptoms. Later, leg swelling, feeling tired, vomiting, loss of appetite, or confusion may develop. Complications may include heart disease, high blood pressure, bone disease, or anemia. 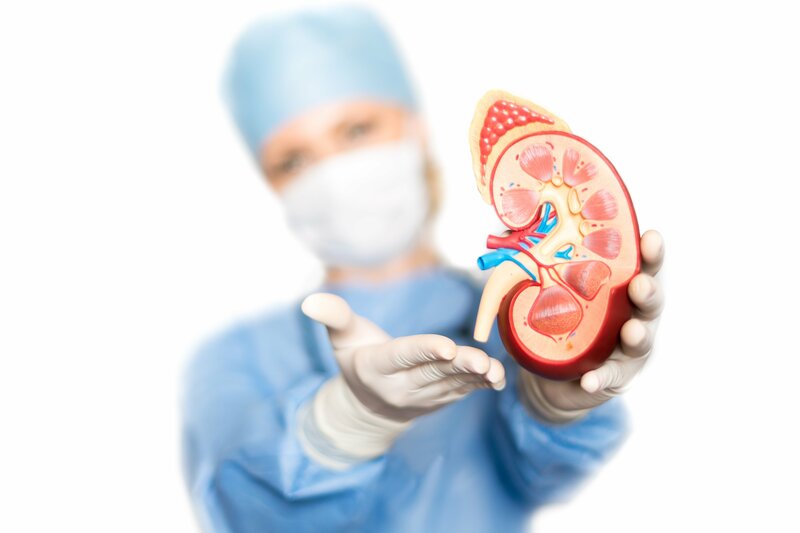 Kidney Disease is usually caused by an event that leads to kidney malfunction, such as dehydration, blood loss from major surgery or injury, or the use of medicines. Examination of the urine (urinalysis) allows a direct assessment for possible kidney problems, which may be suggested by the appearance of blood in the urine, protein in the urine, pus cells in the urine or cancer cells in the urine. Lupus nephritis is an inflammation of the kidneys caused by systemic lupus erythematosus (SLE), an autoimmune disease. It is a type of glomerulonephritis in which the glomeruli become inflamed. As the result of SLE, the cause of glomerulonephritis is said to be secondary and has a different pattern and outcome from conditions with a primary cause originating in the kidney. Non-alcoholic fatty liver disease (NAFLD) is one of the types of fatty liver which occurs when fat is deposited (steatosis) in the liver due to causes other than excessive alcohol use. Non-alcoholic steatohepatitis (NASH) is the most extreme form and is the most common liver disorder in developed countries. A kidney stone is a solid, pebble-like piece of material that can form in one or both of your kidneys when high levels of certain minerals are in your urine. Kidney stones rarely cause permanent damage if treated by a health care professional.​ You may have a kidney stone if you feel a sharp pain in your back, side, lower abdomen, or groin; or have blood in your urine. If you have a small stone that easily passes through your urinary tract, you may not have symptoms at all.